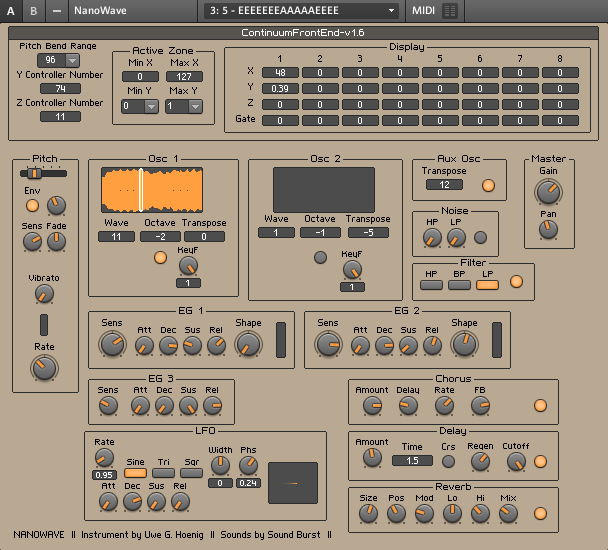 Here are some structures I built for the Haken Continuum Fingerboard using Native Instruments' Reaktor software. 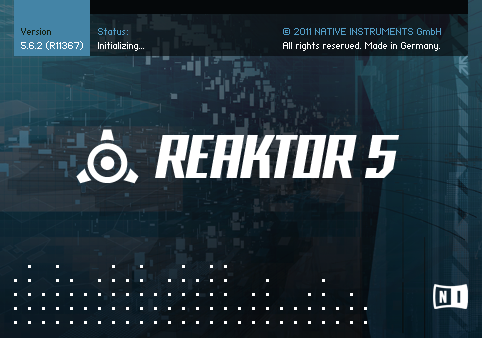 They were made with Reaktor version 5.6.2 so you will need that version or later to use them. 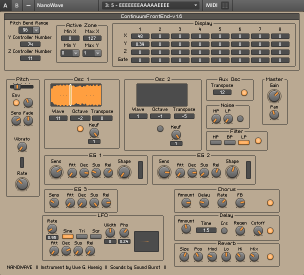 This macro can be inserted into any Reaktor synth with 8-note polyphony to allow Continuum control. 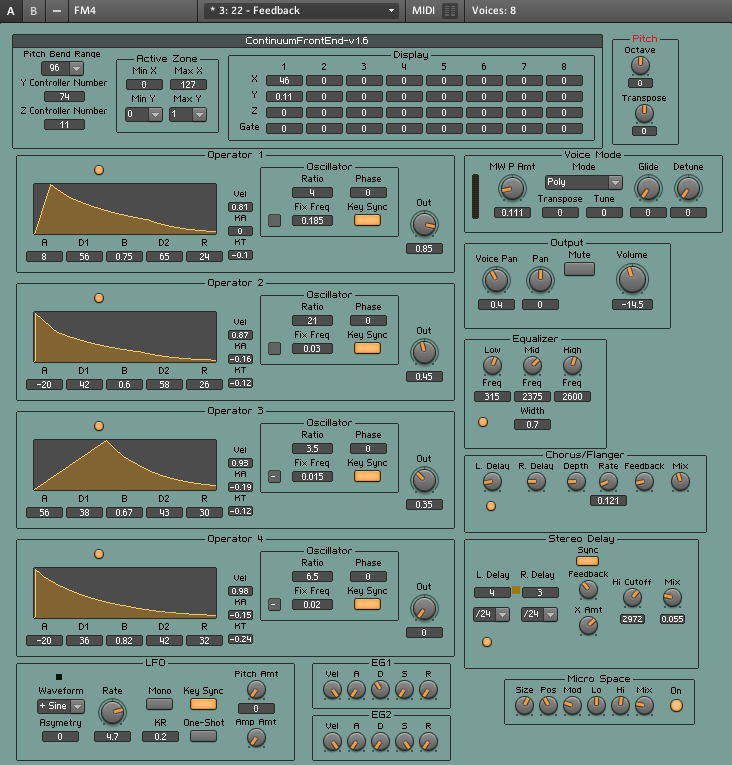 It receives the Continuum's notes, each of which is on a different MIDI channel, and combines them into polyphonic event signals (X, Y, Z, and Gate) that are much easier for Reaktor to deal with. 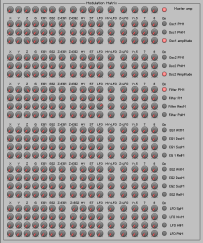 This way one control panel can affect all the Continuum notes at the same time. 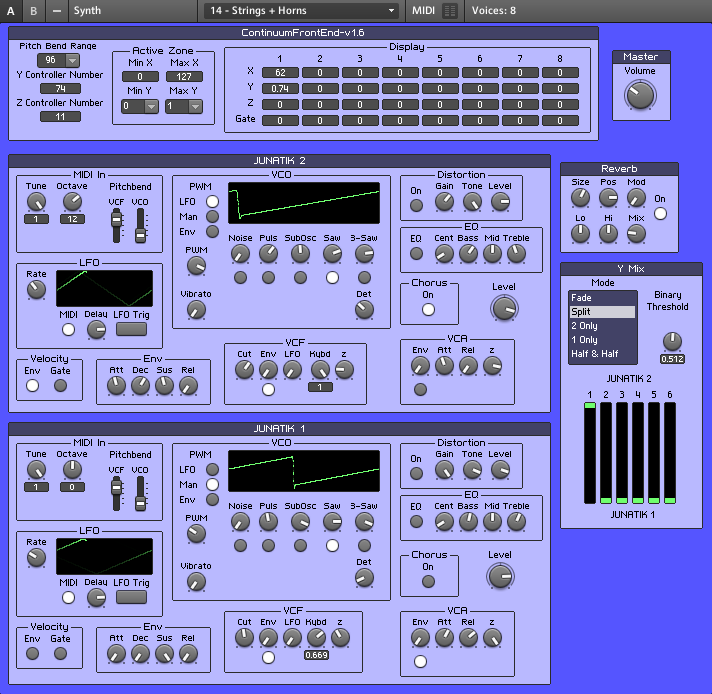 The front end can be added to multiple instruments in the same ensemble and a different rectangular "Active Zone" set for each one. 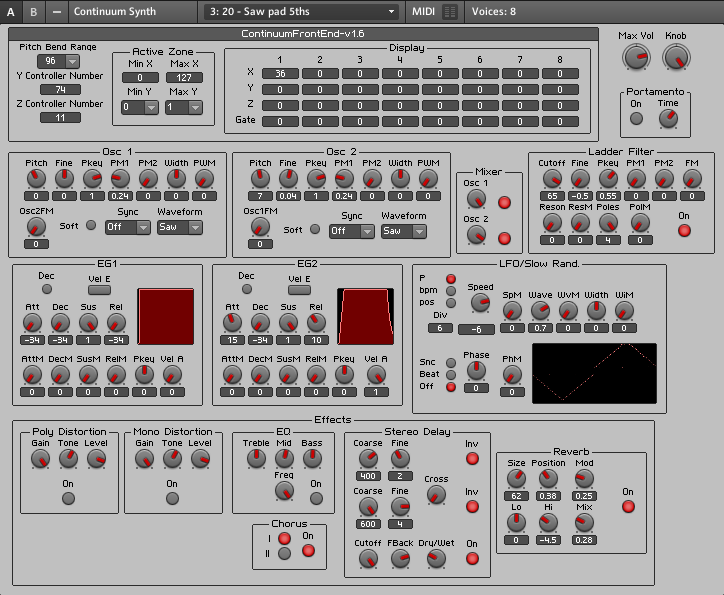 This allows the playing surface to be split horizontally and vertically to control several synths at once. 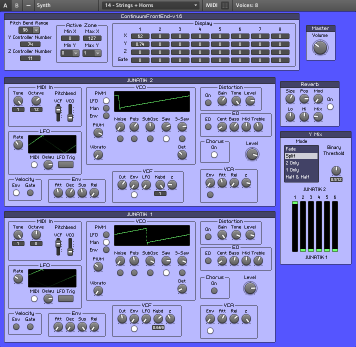 It's often convenient to do major Reaktor editing on a computer other than the performance machine. In my case the performance machines are a Macbook laptop and a Muse Receptor, both of which have small screens that make editing tedious. 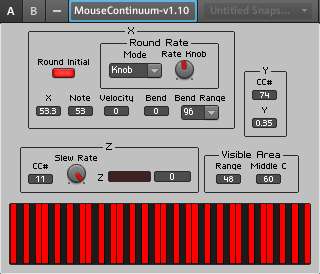 This instrument is a mouse-operated approximation of a Continuum (in monophonic mode, played with one finger) that can be used for testing sounds when there is no actual Continuum hooked up. Plus it's just fun to play with. 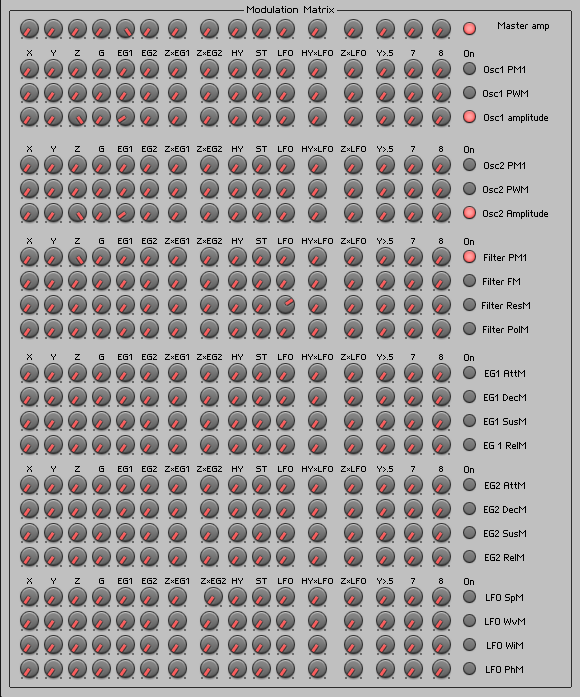 It can be viewed in large- and small-panel versions. 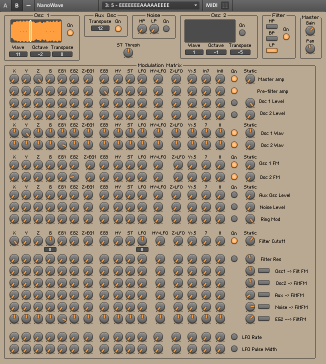 This instrument consists of two modified versions of the "Junatik" synthesizer from the Reaktor library, the outputs of which can be selected or mixed separately for each finger depending on its Y value, i.e. front-back position. I used a version of it to play Handel's 'Alla Hornpipe'. Includes the mouse-operated Continuum instrument. 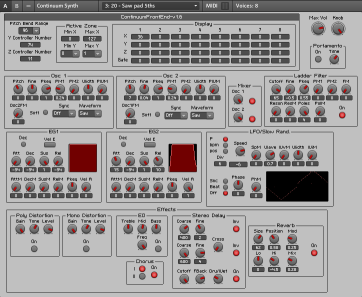 I built this synth by combining various macros from the Reaktor library with the above "front end" and have been using different versions of it for many years to perform, record, and do demos like this and this. 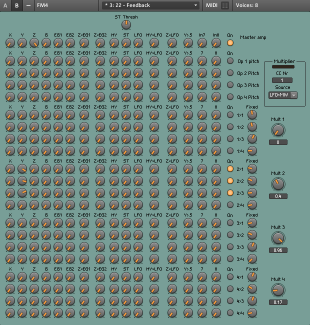 I recently added a lot more modulation options and re-did the control panel so the modulation matrix is on a different page from the section controls. It includes the mouse-operated Continuum instrument for testing. 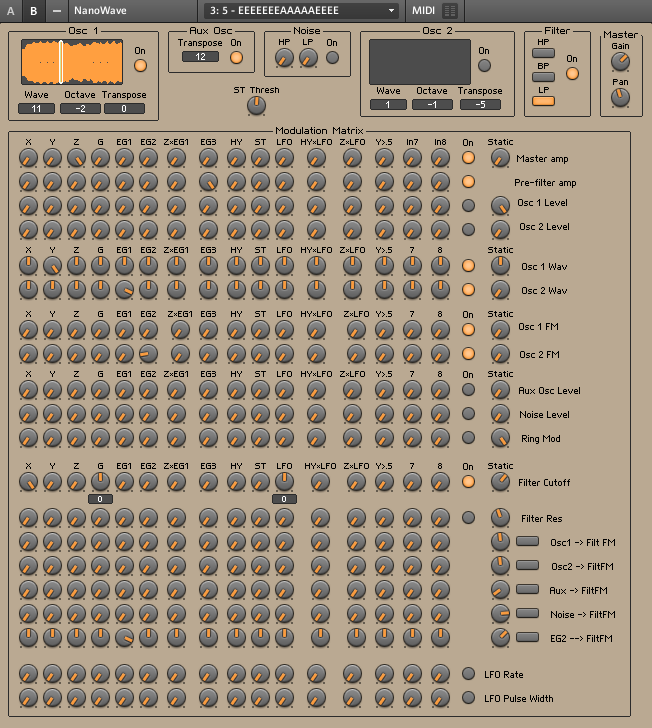 I added Continuum control options to this Yamaha DX7-like FM synth from the Reaktor library. 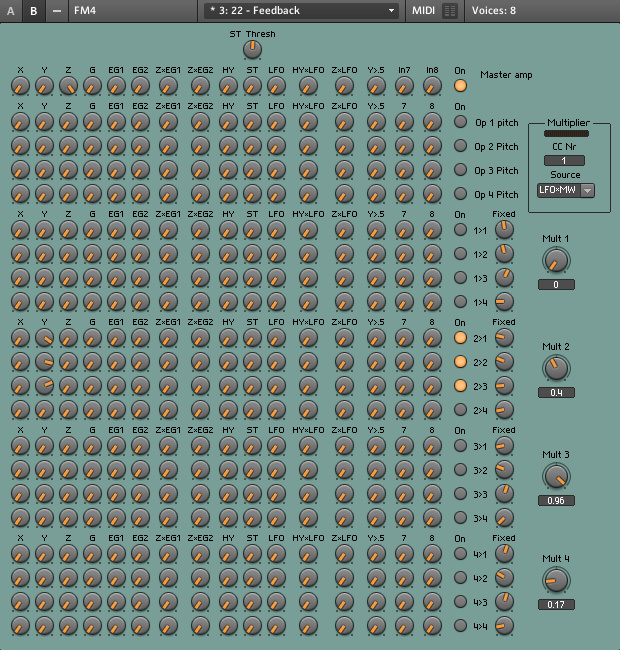 You can make some really INSANE sounds with this thing! It includes the mouse-operated Continuum instrument for testing. I added Continuum control options to this PPG Wave-like synth from the Reaktor library. It includes the mouse-operated Continuum instrument for testing.